Patient presented to Dr. Zucker with an appendectomy scar on her lower abdomen. She underwent a tummy tuck and flank liposuction with Dr. Zucker with the end result shown. Patient presents with right deflated 300cc saline implant. Dr. Zucker placed 400cc high profile gel implants bilaterally to replace her old ones. Patient presented to our office with an augmentation done by another surgeon in 2008. She originally had 540cc saline implants placed by the previous surgeon. Dr. Zucker did only the revisional surgery in the after photo by replacing her implants to a 375cc gel implant bilaterally. 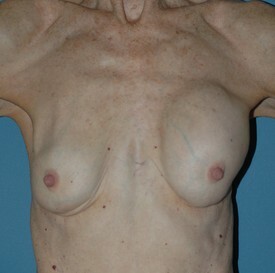 Patient presented to our office with an augmentation done by another surgeon. Dr. Zucker did only the revisional surgery in the after photo by replacing her old implants with new 325cc gel implants bilaterally. Patient presented to our office with an augmentation done by another surgeon, right implant is ruptured and left has a capsular contracture. Dr. Zucker did only the revisional surgery in the after photo by replacing her old implants with new 375cc gel implants bilaterally. Patient presented to our office with an augmentation done by another surgeon. Dr. Zucker did only the revisional surgery in the after photo by replacing her old implants with new 300cc gel implants bilaterally.